Is there anything better than a nice warm bowl of oatmeal on a cool fall day? Actually, there is. It’s waking up to the smell of said oatmeal cooking when you wake up. My absolute favorite kind is apple cinnamon. It’s what my husband cooks me when we’re camping and I’ve adapted it for the crockpot at home. This is a very simple recipe and it doesn’t take long to throw everything into the crockpot at night. I start it right before bed and we all wake up to some yummy hot oatmeal in the morning. This is perfect for those Monday mornings when it’s extra hard to crawl out of bed. Important: Do not use quick cooking oats for this recipe. Regular Oats, rolled oats and even steal cut oats work great. Peel and chop the apples. Add them to the crockpot. Sprinkle the apples with the sugar and cinnamon. Pour the dry oats over everything, then add the milk and water. Cook overnight on low. The oatmeal will cook in 8 hours. If you don’t have milk, are vegan, or want to save a few calories, use 4 cups of water instead of milk and water. Ready to learn how to get a homemade dinner on the table and still have time to tackle everything on your to do list? 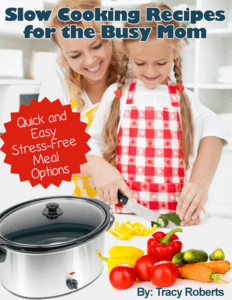 Slow Cooking Recipes for the Busy Mom ebook gives you 30 days of recipes for your crockpot plus shopping lists to make sure you have everything you need on hand for quick & easy stress-free meal planning. There’s even a private Facebook group where we’ll be challenging each other to create delicious meals (and share the recipes). Click now and order your copy of Slow Cooking Recipes for the Busy Mom: Quick & Easy, Stress-Free Meal Options today!